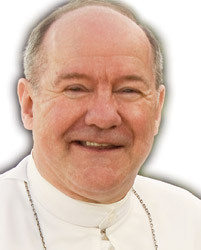 BIO: Abbott Eugene Hayes was ordained a priest by Bishop William Johnson, first bishop of Orange in 1977. After teaching at St. Michael’s and Mater Dei, he obtained a doctorate in Canon Law from the Catholic University of America in Washington, D.C. He then served for eleven years in Rome as the Norbertine Order’s representative to the Holy See. In 1995 he was elected abbot by his confreres for a life term, and was blessed as abbot by the second bishop of Orange, Norman Mc Farland. Abbot Eugene is widely consulted in juridical matters by religious of his own order as well as of other congregations in the US and around the world. Place your cash or check in the basket at the buffet, or make your donation here.